This is a special way to prepare salt cod. It is creamed with olive oil, garlic and a little cream. It's a special dish that is usually served during the Christmas season in Northern Italy and it is wonderful with polenta crostini. Prepare the codfish by soaking in a pan filled with cold water and changing the water every few hours. Do this for at least 24 hours - it may take longer depending how dried the cod is. Cut the cod into pieces and place in a pan and cover again with cold water and add the bay leaves and 1/2 cup cream. Cover and bring to a boil with the lid slightly ajar. Cook at a steady boil for 20 minutes skimming any foam that comes to the top. Once the cod is soft but still holds it shape remove from the water. Discard the bay leaves. Add the garlic and start the electric mixer at low speed to break up the fish. At medium speed start adding the olive oil. Keep mixing and add the remaining 1/4 cup cream. You may need extra olive oil depending on the cod. The baccala should be a light color and have a whipped, mousse-like texture. Add freshly ground black pepper to taste. Salt if required. Garnish with Italian parsley. Serve on grilled slices of polenta, fresh slices of baguette, crostini, crudites, or crackers. *The immersion blender works like a charm. 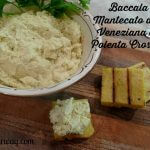 It breaks up the baccala and easily blends in the olive oil, garlic and cream.